Hooymans Compost B.V. has a rich history going back to a nursery in Kerkdriel, where Gerard Hooymans started growing mushrooms in 1969. This nursery in Kerkdriel laid the foundation for the present operation in Velddriel. In their work, Hooymans senior and junior were regularly confronted with the problems arising from raw materials. With the experience and expertise gathered, a decision was made to focus on the production of compost. Many years of learning, improving and persevering led to the sought-after quality product for which Hooymans Compost B.V. has become renowned worldwide. The decision to go into compost production proved fruitful. The demand for compost soon began to increase exponentially within just a few years. With the current production of 6,000 tons of compost a week, Hooymans Compost is one of the world’s largest private compost producers. “We imitate nature, but with today’s technology”. Composting is a process that takes its time. The natural process is still respected every day in the operation, and the raw materials identified many years ago still form the basis. However, Hooymans Compost B.V. selects these raw materials with the greatest care and precision. The best raw materials, combined with today’s most advanced techniques, culminate in the perfect crop. 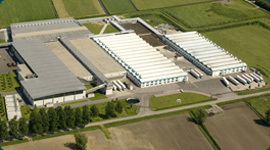 The size of the plant enables Hooymans Compost B.V. to carry out the complete process, from raw materials to end product. For the grower, this leads to an understanding of the duration of composting and a high predictability of the cultivation. Hooymans Compost B.V. is proud of the quality of the product it delivers – a product ‘from nature to nature’, where quality, innovation and environmental awareness take centre stage.